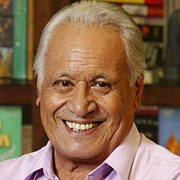 Howard Morrison was born on August 18, 1935 in Rotorua, one of six children born to Temuera Morrison, a former Māori All Black, and entertainer Kahurangi Morrison (also known as Gertrude Harete Davidson). His siblings included future Ngāti Rangiwehiwehi kapahaka leader Atareta Maxwell, Judith Merenia Tapsell, Rene Mitchell and Linda Morrison. Raised in Rotorua and the town of Ruatahuna (in Te Urewera), Morrison attended a nearby native school before going to Hawkes Bay' Te Aute College, and Rotorua Boys High School. His dreams of becoming a professional entertainer were sparked by Māori culture groups and concert parties; but the jobs he took after leaving school included working as a land survey chainman for the Department of Māori Affairs, an electricity meter reader for the Tourist Department and a storeman at Whakatu freezing works. With two friends, Morrison began singing for his fellow freezing workers, then joined the Awapuni Concert Party, one of the first groups to mix contemporary sounds with traditional Māori music. He was also honing his singing skills in the Clive Trio. After the death of his father at the end of 1954, Morrison returned to Rotorua, playing rugby for Waikite and organising vocal groups to entertain at rugby club socials. After touring Australia with the Aotearoa Concert Party, he put together a group with his brother Laurie, cousin John, Gary Rangiihu, Chubby Hamiora and Wi Wharekura to contest Rotorua's Christmas carnival talent quest. They won. Morrison, Rangiihu and Hamiora then added guitarist Gerry Merito, and competed in a talent contest in Hamilton as the Ohinemutu Quartet. This time they came third. In 1957 Morrison married Rangiwhata Ann Manahi (Lady Kuia). They had two sons and a daughter. 1957 was also the year Morrison got more serious about his music, forming the Howard Morrison Quartet with his brother, cousin and Gerry Merito. After seeing them, Auckland entrepreneur Benny Levin toured the quartet nationally as part of a rock and roll package show. Levin also put them in producer Eldred Stebbing's Auckland studio on a single by single deal with Zodiac Records. Morrison argued later that it was Stebbing who came up with the idea of the title The Howard Morrison Quartet. Their second single, 'Hoki Mai' took off in Auckland and Rotorua, although some Māori were offended that the song's transformation ignored its place in the history of the Māori Battalion. After Harry M Miller spotted the band playing a regular Saturday gig at an Auckland dine and dance restaurant in 1959, he became their manager, signing them to his label La Gloria records. At this stage the line-up stabilized. John and Laurie Morrison and Tai Eru had been and gone, and Wi Wharekura and Noel Kingi took up the baritone and bass roles. Looking at the success the band had for Zodiac with 'The Battle of the Waikato', Miller suggested it parody another Lonnie Donegan song, 'My Old Man's a Dustman'. The result was 'My Old Man's an All Black', a humorous protest at the exclusion of Māori from the team for the 1960 rugby tour of South Africa. Recorded cheaply at a concert in Pukekohe, it went on to sell 60,000 copies. Miller proved an astute promoter. The band were appearing in clips screening in local cinemas, on a run of increasingly successful tours, and on the new medium of television. On 1 June 1961, the group were among the acts to perform on the first night of official transmission, via Auckland channel AKTV-2. The following year they sang on Saturday night variety show The Time, the Place and the Morrisons. Miller shifted to Australia in 1963, but Morrison was reluctant to follow. He called time on the quartet the following year, and went solo. Decades later, he spoke of being proud that the Quartet "were able to bring Māori culture to the white, Pākehā majority So the Māori part of us, we didn't have to beat our chests about. It just came out naturally." In 1965, Morrison headlined two-part TV special The Howard Morrison Half Hour, which saw varied entertainers performing in a North Shore ballroom that was so cold, fog could be seen coming from the singer's mouths. He also played a Māori shearer in Australia's Funny Things Happen Down Under. Produced by expat Kiwi Roger Mirams, the family film also featured a teenage Olivia Newton-John. Although Morrison only sang two songs, he took pole position in some versions of the movie poster. The following year Morrison brought his charm to a starring role in John O'Shea's big screen musical comedy Don't Let It Get You. Morrison was also an investor in the film, which was one of only two New Zealand features made that decade. The cast of performers included ex Howard Morrison Quartet member Gerry Merito, Lew Pryme, Kiri Te Kanawa, and showband the Quin Tikis. Morrison's performance helped him earn the Entertainer Of the Year award. Over the next few years he established a reputation on the Asian Pacific circuit including Hawaii, Thailand, Singapore and Taiwan, returning home for short cabaret residencies in Auckland. In 1968 he released two solo albums, Born Free and Power Game, plus a duet album with country singer John Hore, Take Ten. He switched to RCA in 1969 for Getting It All Together. Morrison's passion was not just for music; he also felt a need to help young Māori reach higher levels of achievement in education. Recruited into the Department of Māori Affairs by its visionary secretary Kara Puketapu as a youth consultant, Morrison developed programe to address Māori underachievement. The success of his work in schools and his marae education programmes snared him the position of director of youth development in 1979. Morrison's nephew, actor Temuera Morrison said his uncle's love for his nephews and nieces was a precursor to his work with youth development; Tem's own success was due in part to the pathway his uncle carved out for him. "I remember as a young boy, growing up — we were always told to stand up and make a speech, stand up and sing a song, do this and do that, and when I look back, he was grooming us, training us for our journey." Besides Howard's booming voice and a charismatic stage presence, Temuera described his rare ability to get the crowd in the palm of his hand. "As a young guy, I used to see him always working the crowd, milking the crowd, and knowing which song to come in on. He would have a selection of songs and he would rehearse all of them and he would tell the band, 'well, good luck,' because he wasn't quite sure how he was going to play the crowd. That was a specific talent." A number of Morrison's live performances screened on television. Footage of a 1975 reunion of the Howard Morrison Quartet was accidentally destoyed before broadcast. In 1982 Morrison recorded this television special in Hamilton. The previous year he had performed hymn 'How Great Thou Art'/ 'Whakaaria Mai' at the Royal Command Performance. It became his greatest solo success, topping the national charts for five weeks. In 1989 Morrison was honoured on this episode of This is Your Life. The following year he sang at the opening ceremony of the Commonwealth Games, and performed a special concert with the Auckland Philharmonic Orchestra. Another concert, 1995's Sir Howard Morrison - Time of My Life, marked his 40th year in showbusiness. By now Morrison had been knighted for his services to entertainment, with the investiture ceremony at his home marae of Ohinemutu. In 2002 he was the subject of an hour-long documentary by Bryan Bruce. To Sir with Love marked his last concert, filmed in Rotorua's Civic Theatre in 2009. By mid-September of that year, a three-part interview (Sir Howard Morrison - He Kotuku Rerenga Tahi) originally recorded for Māori Television, was topping DVD sales charts. Sir Howard Morrison died on September 24 of 2009. He is buried at Kauae Cemetery in Ngongotaha, Rotorua.